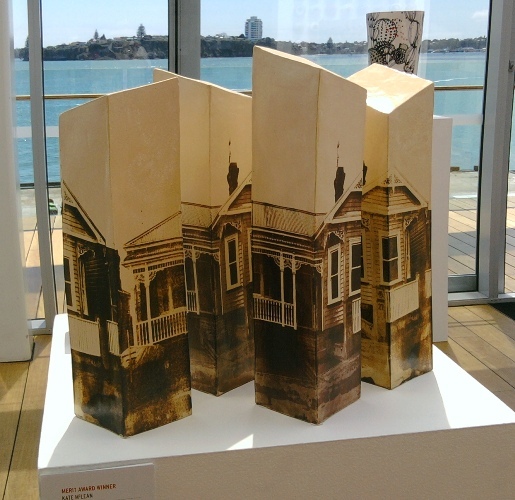 The Exhibition is being held at The Cloud at Downtown Auckland this year due to renovations at Lopdell House. What a stunning venue, filled with sunlight with the harbour glistening in the background. In amongst the crap there was some beautiful pottery. I took photos with my phone camera and they didn't come out too bad. Here are some of the pieces that took my eye. This won a merit award. Duncan Shearer - these were just beautiful! Sangsool Shim & Keumsun Lee - this was absolutely stunning!!! Chris Weaver - a master craftsman indeed! Nadine Spalter - These kept drawing me back to them. Such an awesome colour! Yes I went to the opening night. The judge ( by a per recorded speech )said he took out all the good stuff and looked at the rest I think ric should have got first his work had the wow factor he understands what he is doing and produces quality .